The Raptors waited almost a decade for DeRozan to become a two-way player. The Spurs need him to do it now. DeMar DeRozan’s offensive acumen is well established. He should immediately help a Spurs team that often struggled to consistently get buckets last season. The real concern about his addition comes regarding his ability on the other end, where his track record is spotty at best. The Raptors took a step forward on defense in the past three seasons, finishing 11th, eighth and fifth in defensive efficiency, respectively, after a dreadful 23th ranking in 2015. In those three years, however, they have been 5.9 points better on average with DeRozan off the court, a massive mark. Individual defensive stats are tricky, whether they are advanced or rely on player tracking, but when most point to DeRozan a net negative on his own end, it’s hard not to pay attention. Watching him play only confirms what the numbers suggest: DeRozan has defended poorly. The Spurs surely know that. The task at hand, then, is to find out why and whether he can be taught how not to be one. Let’s take a look. The Raptors relied heavily on DeRozan to create offense. Because of that — and his flaws as an on-ball defender that we’ll explore later — he was hidden on defense. DeRozan guarded the opponent’s least threatening offensive player, typically a spot-up shooter. He essentially used that time to rest. The Raptors would zone out on the weak side, like many other teams do. DeRozan often started a possession in a corner and would finish it in the same spot, as he’d switch off ball screens. He essentially didn’t typically have an assignment that he was tasked with stopping. Needless to say, that encouraged the development of habits. Those switches started to come on plays in which he should have chased his man. He sometimes would just lose him as he was ball-watching. He was one of easiest players to back screen after he rotated over to help inside. And as previously examined, his closeouts weren’t always conscientious. In short; he could be a liability off the ball. DeRozan’s spacey defense was no secret. It reportedly frustrated teammates and was one of the reasons Dwane Casey was fired, according to Sportsnet Michael Grange. DeRozan was never pushed to become a better player on that end and, despite having a team-first attitude and a terrific work ethic by all accounts, he never pushed himself either. He seemed happy in an environment without accountability. DeRozan is 6’7” with a 6’9” wingspan. He’s not the most laterally quick player in the league, but he’s not slow either. He has the tools to be, if not a stopper, at least a decent defender. He doesn’t have great technique, but that shouldn’t matter. His biggest problem on that end is a notorious lack of effort. DeRozan typically presents token effort at the start of the play in isolation situations, but if his opponent is crafty at all, he’ll find a way to exploit DeRozan. Once the man he’s guarding has an advantage, DeRozan tends to give up on the play. It’s even worse when screens are involved. The Raptors had him going over the screen and letting the big man contain the ball handler. But when going over like that, the perimeter defender is supposed to hustle back to his man or at least get into his inside shoulder. DeRozan rarely does that. He’s just happy slowing down to lessen the impact of the screen, getting behind the play and waiting for the big man protecting the paint to bail him out. He’s been a lackadaisical defender who seems happy trying to get back the points he concedes on the other end. In isolation situations, DeRozan ranked in the 50th percentile despite not often covering the opponents’ best scorer. He’s in the 30th percentile guarding ball handlers. And he’s in the 31st percentile guarding spot up plays. There was no place to hide him, which is why Dwane Casey benched him in the playoffs. 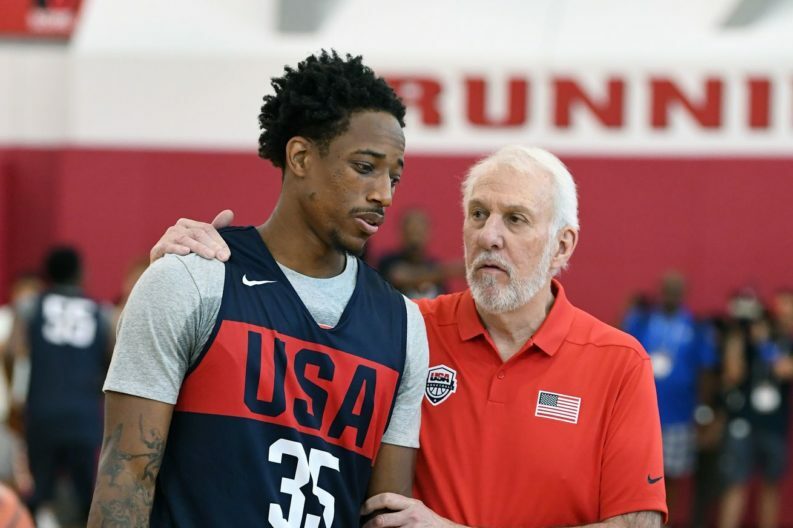 Gregg Popovich has never been afraid to hold his players accountable. This is a tough situation, however, because DeRozan has been used to coasting on the defensive end for years. It won’t be easy to change his ways, especially since he was traded to San Antonio — not signed here by his own volition. He didn’t volunteer for the Pop treatment. There’s still some reason for optimism. Before DeRozan was traded, Raptors coach Nick Nurse talked about challenging DeRozan defensively and holding him accountable. It’s the type of stuff every coach says in the offseason, but according to Nurse, DeRozan was up for it. If his attitude remains positive, Pop and the rest of the staff will coach him up. DeRozan’s lack of awareness on defense might be a more complex problem to fix. A lot of people bring up LaMarcus Aldridge’s improvement on defense as an example of how easily the Spurs can transform players. The difference is Aldridge had demonstrated good defensive instincts in Portland. DeRozan has a lot more to learn. The fact that the Spurs won’t be able to hide him all that well on defense even if they tried could be weirdly helpful there. Rudy Gay can’t handle quick shooting guards. Dejounte Murray probably can, but DeRozan would likely struggle against a point guard. He’s going to have to guard good offensive players on a near-nightly basis. He’ll have to quickly figure out how to do it, or be exposed far more than he was in Toronto. Asking DeRozan to become a plus defender at this point in his career is foolish. No matter how big the chip on his shoulder is, it won’t suddenly enable him to unlearn bad habits. The Spurs don’t have some magic dust they can sprinkle on him to turn him into Danny Green either. The hope with DeRozan is that he’ll realize that in order to have success, he’ll have to put in the effort to become at least an average defender. No one will make excuses for him if he doesn’t. If he puts his famous work ethic to the service of that part of his game, he could be able to get past his limitations and learn how to be useful. The Raptors waited for years for DeRozan to take that step. Hopefully all he needed to make a real commitment to defense was a change of scenery. The Spurs’ seeding — and maybe even their playoff hopes — likely depend on it.